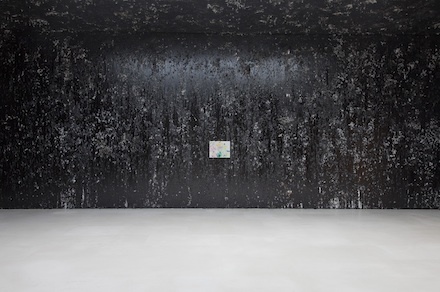 Dan Colen, Out of the Blue, Into the Black (2012), Installation View. All photos courtesy of Gagosian, Paris. For his inaugural solo show at the Paris Gallery, Gagosian presents the exhibit, “Out of the Blue, Into the Black” featuring new works by Dan Colen. The New York artist, known for his participation in the Downtown art scene of the early 2000s, here memorializes his late friend and fellow artist Dash Snow in a tripartite installation of paintings and sculpture. The exhibition title, as well as those of the objects within it, references the opening and closing songs from Neil Young’s seminal 1979 album, Rust Never Sleeps: “Hey Hey, My My (Into the Black)” and “My My, Hey Hey (Into the Blue)”—confronting the fear of obsolescence and death in an elegiac tribute that is both celebratory and somber, hopeful and despondent. Dan Colen, born in New Jersey in 1979, graduated from RISD with a BFA in painting in 2001, and quickly became an artistic presence amongst the group of young artists in Downtown Manhattan whose art exposed the gritty subculture of the city and their fast lifestyle of drugs and partying. From the artist’s early photorealistic paintings of paper ephemera to his trompe l’oeil sculptures of graffitti-tagged papier-mâché boulder or 2004’s My Friend Dash’s Wall in the Future–Colen’s work is often painstakingly rendered to achieve material similitude, revealing and interest in illusionism, materiality and abject objectivity. Through mimetic naturalism and object appropriation, his work engages in an art historical dialogue with the readymade, Minimalist object, and abstractions of modernism, oscillating between artistic axioms and conventions towards a unique command of his materials. His infamous use of chewing gum to create colorful abstract canvases, the presence of the fantastic and ordinary, his reclamation of found media as instruments of production and products themselves—these evolutions in aesthetic and conceptual direction, marked by a collision of high and low, permanence and ephemerality, reality and illusionism, develop an ongoing investigation of the transcendental potential of art. 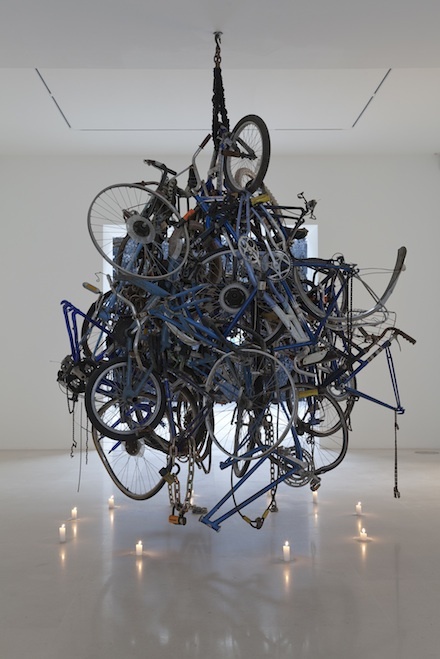 Upon entering the gallery, one is confronted by a hanging entanglement of blue bicycles, suspended in a metallic knot from a hook in the ceiling. Entitled My Old Friend The Blues, this sculpture is composed of chains and bicycle parts scavenged from the streets of New York City, discarded and dejected, yet here given new life. The color, an incarnation of the title and the eponymous Neil Young song, “Into the Blue”, is that of melancholy, sadness and infinity. Hung in a dark hall like an inverted candelabra, it is surrounded by a ring of candles, forming something of a ritualistic shrine—a tribute to the triumphal power of art to reclaim and revive. Colen describes his use of ‘reality’ as material and agent in his artistic process; the “real world objects” limit his artistic presence and intervention to imbue the works with a history and infinity outside his control. This marriage of chance and artistic invention characterizes his confetti works—a recurring subject in recent paintings that developed out of his explorations with chewing gum, which reminded him of ‘a parade for JFK’. The pagan ritual of spreading confetti, an ancient mechanism of celebration, permits Colen to render the accidental scattering of paper pieces as a formalist system in both trompe l’eoil reproductions and with ‘real’ Mylar confetti pieces. The psychological charge released by these soaring particles of celebration are inflected with both joy and sorrow, “double-edged” in their flight and fall, carrying the weight of temporality in their suspended state—at once eternalizing and halting the never-ending party that characterized his lifestyle with Snow. 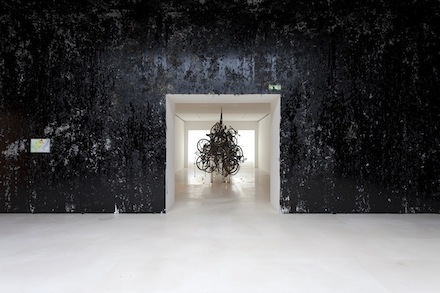 In the main galley space, themes of chance and celebration take a morbid turn, where the walls and ceiling are literally tarred and feathered, slick with dripping oil, white feathers scattered across its macabre surface. This allusion to the barbaric ritual of mob vengeance, scarring and humiliating demarcation of the body, enacts a morose dialogue with the small paintings hung on each wall—white ground, unframed windows of jubilation and festivity. Bright swatches of color, seemingly abstract representations of confetti, make further allusion to Dash Snow, entitled Moments Like this Never Last, after Snow’s 2005 Rivington Arms exhibition (a lyric mined from the Misfits). The tension between these spirited paintings within the oppressive tarred environment is echoed by the large skylight that pierces the dark enclosure, casting glistening light onto its viscous oily surface. Like the flying shreds of phone book in his famed NEST (in collaboration with Dash at Deitch Projects) and the swirling shocks of color in the confetti paintings, the feathers announce uplift, frozen in a moment of chance landing. 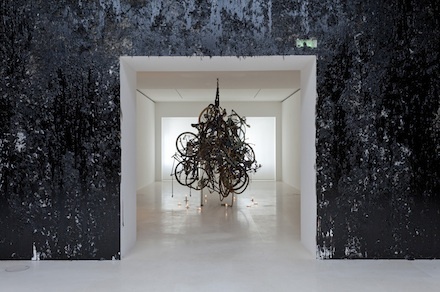 Yet their splintered flights are not only caught in a moment of time, but are caught in the material composition of the installation, trapped in the tar, stagnate and stilled as eternalized suffering—the gallery standing in for a body in pain. This tripartite eulogy to his late friend and collaborator harnesses the traditions of his broad aesthetic course, yet forges forward, matured in the light of a tragic loss and awakening, imbued with hope through the redemptive power of art. This entry was posted on Monday, July 9th, 2012 at 12:37 am	and is filed under Art News. You can follow any responses to this entry through the RSS 2.0 feed. You can leave a response, or trackback from your own site.